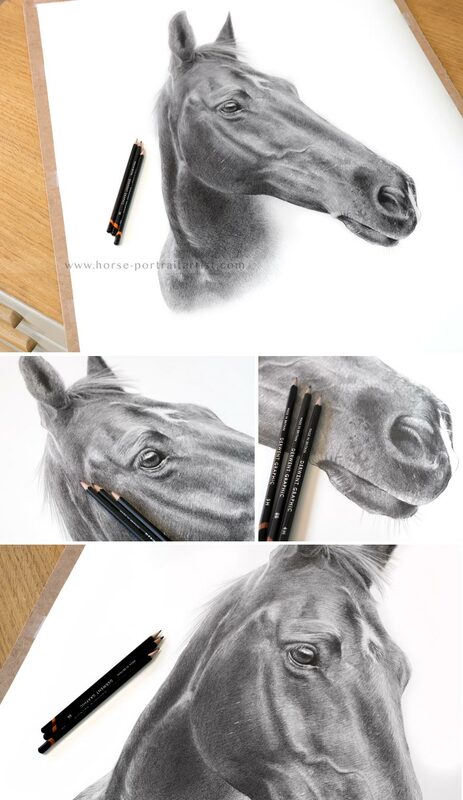 Welcome to my horse pet portraits in pencil. As you may already know my name is Melanie Phillips and I am a professionally trained horse pencil portrait artist. 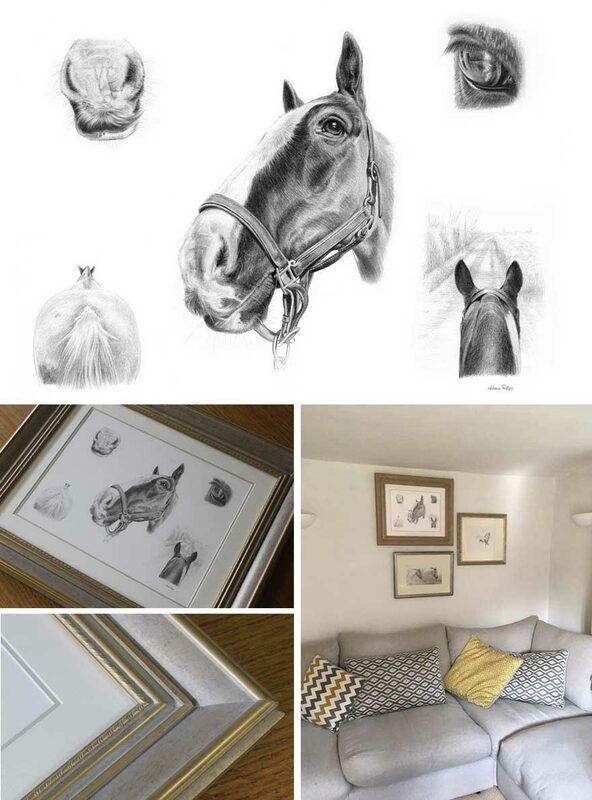 The horse portraits below hand drawn by myself and are commissioned by clients worldwide. 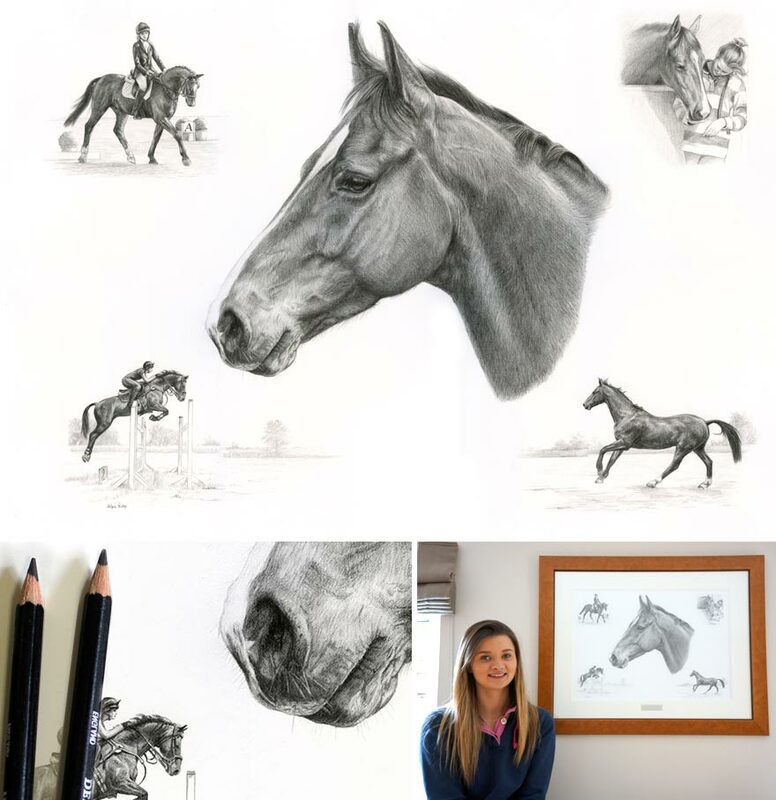 I can be commissioned to draw a portrait of your horse - where ever you are in the world. I receive commissions from far and wide. I work each day on my drawings in our beautiful art studio in our wooded garden. I work here along side my husband Nicholas Beall. Nicholas is also an artists and he paints horses in oils on canvas for commission. We are also accompanied by our Tibetan Terrier Lily who sleeps quite happily in our studio every day. We also have a handful of chickens in our garden, who keep us in good supply of eggs all year round. 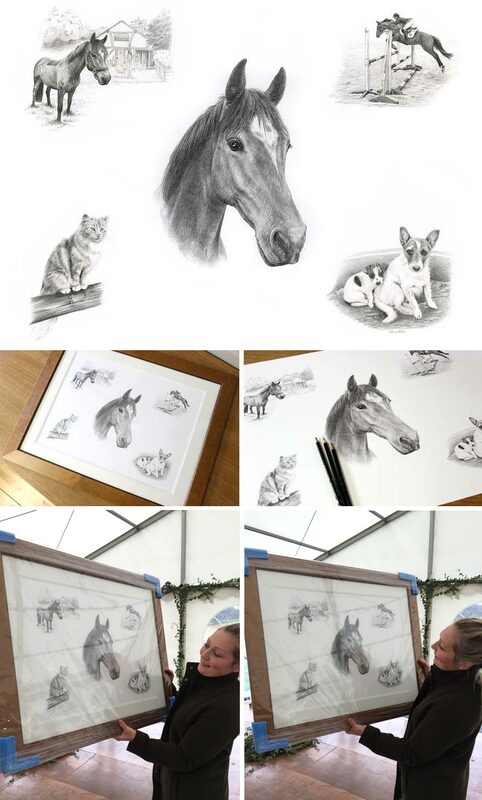 I hope that you enjoy viewing the portraits in my gallery below and if you would like to see more of my work, please do head on over to my main pencil drawing website here - Pencil Pet Portraits. You can read about my commissioning process, view my prices and also contact me from there too. 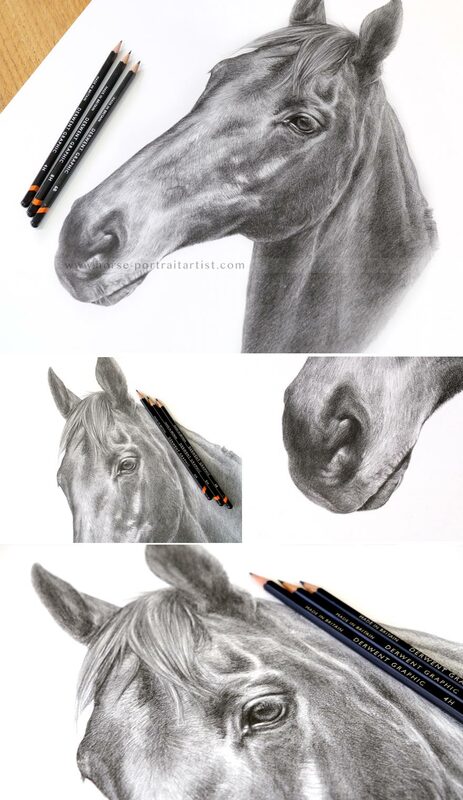 I am looking forward to working with you and drawing your horse in the coming weeks and months! 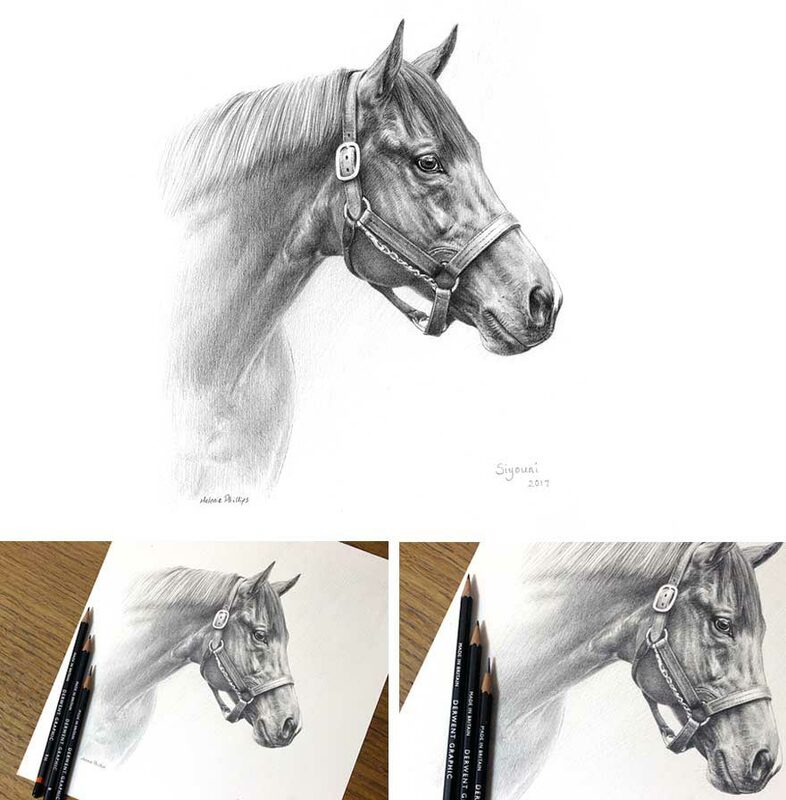 The horse portrait in pencil of Flash was commission by a returning customer from Australia and it was wonderful to work with her again. Jo and her daughter contacted me with a request for a large pencil drawing at 30 x 20 inches of their beloved horse called Flash. Sadly Flash passed away very suddenly and it was such a shock to all of the family. So Jo commissioned me to portray him in pencil and I thoroughly enjoyed drawing him. Jo emailed when she received the drawing below. It really melts my heart to read wonderful emails like Jo's and I am so thrilled I was able to create the drawing for her and her family to remember Flash by. I don’t know what to say, opening your beautiful sketch of Flash made me and my daughter burst into tears, you have captured him so perfectly. He was the most amazing horse, an absolute one in a million and I will never get over the sudden loss of him. I can’t thank you enough, you are so talented and so beautiful to work with. One day I will pop in to see you and thank you in person. 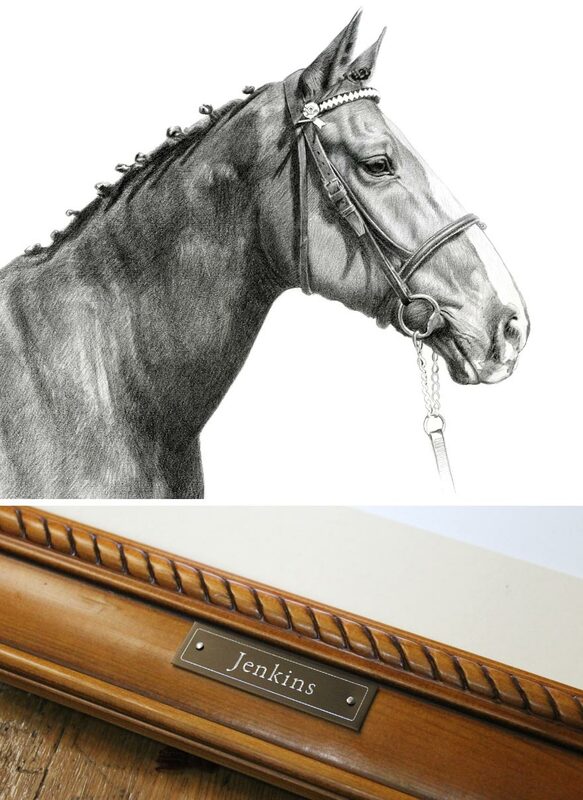 The horse portrait of Duker was commissioned by Lizzie and her brother for their mum on her 70th Birthday. Lizzie knew that she had left it very late in organising the portrait and so ordered one of my Gift Vouchers to give to her mum on her birthday. Lizzie knew that her mum Jane would be able to send or take photos of Duker especially for the pencil drawing so left her to make all of the arrangements as to what she wanted. Which Jane did! The portrait came out beautifully and Jane and her family were thrilled as you can read in Jane's email below. The portrait was a 20 x 16 size drawing traditionally hand drawn on fine Italian paper. Thank you very much you are so talented! This wonderful portrait will give me many happy hours in the years to come. 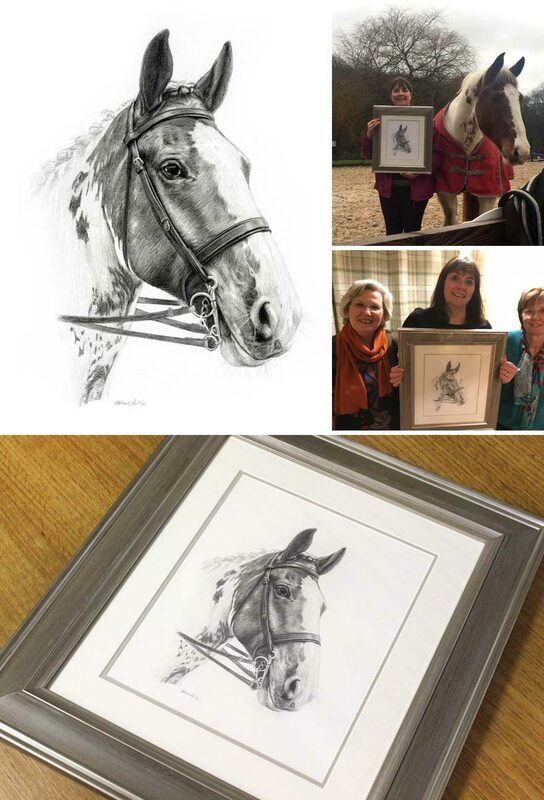 The portrait of Cherokee is a recent portrait of a horse in pencil completed as a surprise present from two aunts Maureen and Pauline to their niece Caroline. The portrait was a 12 x 10 pencil drawing framed by our framer in our beautiful Madison frame with a lovely double mount. The inner mount being a mid grey to bring out the pencil drawing and the colours in the frame. It all worked so beautifully. Caroline was thrilled with her gift and very kindly posed for photos with her aunts and the portrait along with photos of her and Cherokee too! You can read a lovely testimonial from Pauline below. Just received these 2 photos from Caroline at the stables. She wanted you to see them and how delighted she is with the portrait. The photo of us is of Maureen (L) our niece Caroline and me Pauline. All the family think your portrait is beautiful! The frame is a triumph and goes beautifully. Thank you again. I am in awe of your and Nicholas’s talent. You are both so gifted and create wonderful portraits of people beloved pets. Big hug for you and little Lily. Siyouni is a highly successful young stallion owned by the Aga Khan. The portrait was commissioned by Lady Bamford as a gift to the Aga Khan for his birthday in December 2016. The portrait was a 9 x 11 pencil drawing and we hope that the Aga Khan was thrilled! My montage drawings are particularly unique. Clients can have up to 5 drawings in one portrait, usually with one drawing much larger than the others. 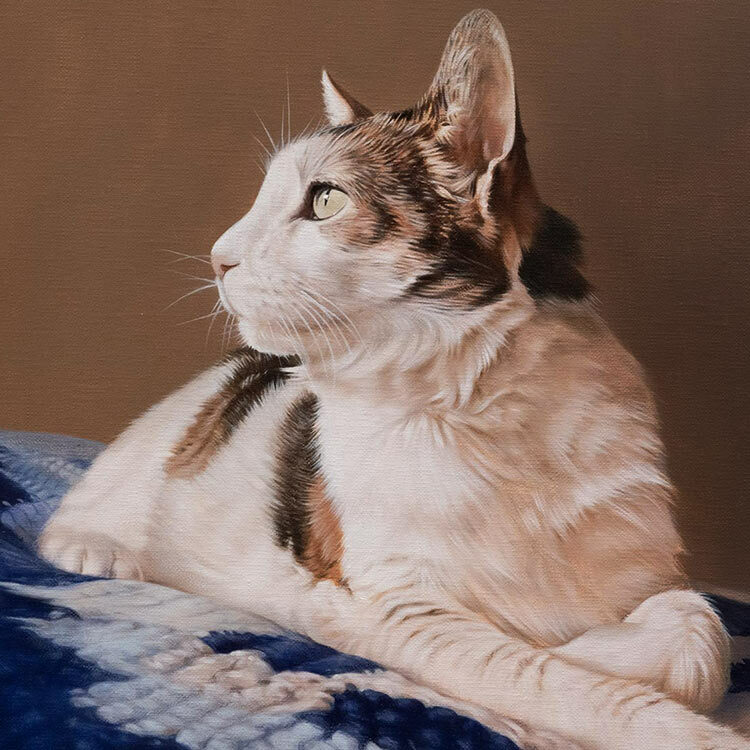 This portrait of Jasper was commissioned by Richard form the UK as a special gift for his wife on her birthday. Laura was thrilled with the drawing which we also framed too. Montage drawings need to be drawn on my larger sizes and the photos provided have to be extremely good quality. Each photo that Richard provided mean something special to the family, they were superb quality to work from and it made for a very successful portrait. I hope you like it too! What can I say but that's is amazing I don't know how you do it. I just know that Laura will love it. You really have done him justice & captured him in all his cheeky glory. 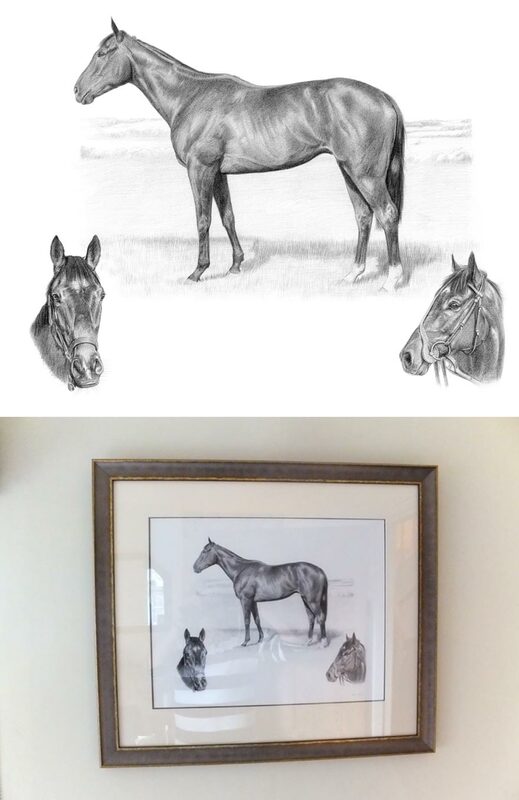 William Archer contacted me in 2018 to find out if I would be able to draw a large montage pencil drawing of their horse called Locksie as a surprise wedding present for his fiancé Annabel. William had a number of specific photos he wanted me to use in the portrait, including one of their horse next to a barn, one of Annabel jumping Locksie, one of her cat and the final drawing was to be of her two dogs. It is really important when collecting or taking photos for a montage drawing that they are all of very high quality. The portrait was framed and sent to William to give to Annabel just before their wedding day. You can see two photos of Annabel in their gazebo making preparations for their wedding with the portrait. You can also read a lovely testimonial form William below too. This portrait was a very emotional one for the owner as our clients father owned Jenkins both were retired form the police force. Jo's father rode Jenkins of the last time at the age of 82 before his sudden death a few months later. This portrait will bring back wonderful memories of her father and a lovely portrait of Jenkins too. If you would like to find out what a portrait similar to this might cost, I have a prices page on my website. The portrait of Rose was commissioned for a Christmas present by Callum Mould, UK. He arranged the entire portrait and we workd together on the design and composition as a complete surprise for his girlfriend. She was absolutely thrilled to unveil the portrait on Christmas day in 2015. Callum asked if I could draw a rose on the drawing instead of writing the name 'Rose' which works fabulously. The portrait of Charles was commissioned by a returning client as a gift for a good friend of his racehorse called Charles. My client emailed a number of lovely photos of Charles to me and had a specific idea about the composition of the montage. Karen the client wanted two smaller studies and a full body pose in the centre. 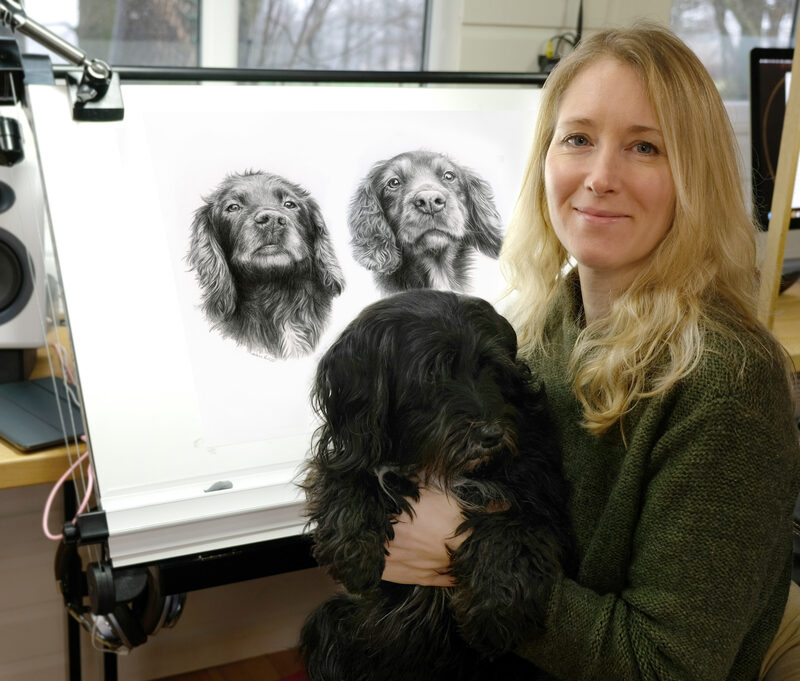 The design and feel works really well and I always encourage clients to let me know their ideas for the portraits design so we can work on them and create something exactly how they envisage their portrait to be. 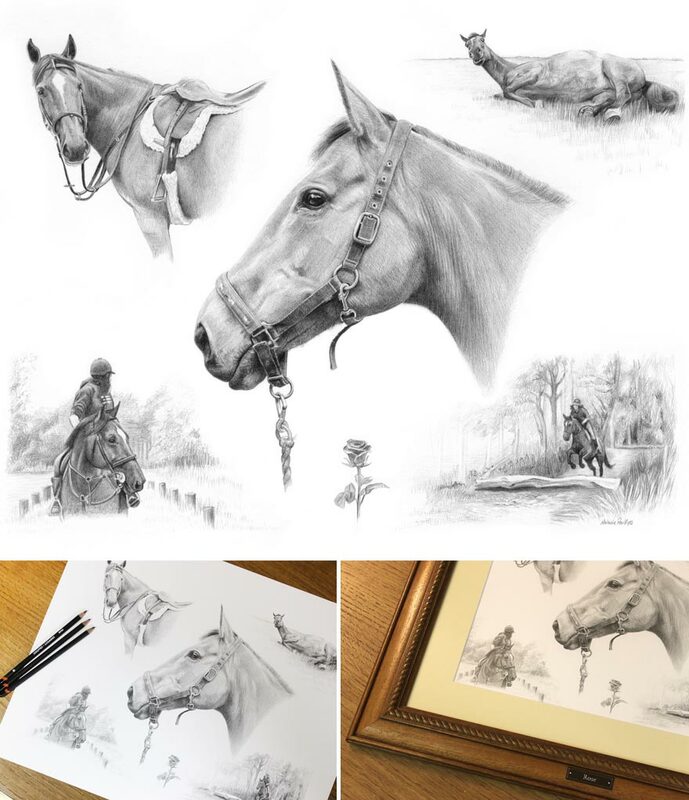 If you would like to see more of my horse portraits and portraits of cats and dogs too, why not pop over to my dedicated Pencil Portraits Website? You can access prices, size and information, videos, portraits up close in detail gallery along with lots of wonderful testimonials from my clients too. Click on the image below to visits and let me know what you think! Pencil Pet Portraits. I have had many happy clients over the last 20 years and if you would like me to create a portrait of your horse, please don't hesitate to Contact Me at any time. I am really looking forward to seeing your photos!